Happy Friday everyone! It's been quite a crazy month over in my household. My twins are getting bigger, faster, and more exhausting (ha! ), but I do find the time to squeeze in sewing. It's what keeps me feeling normal! 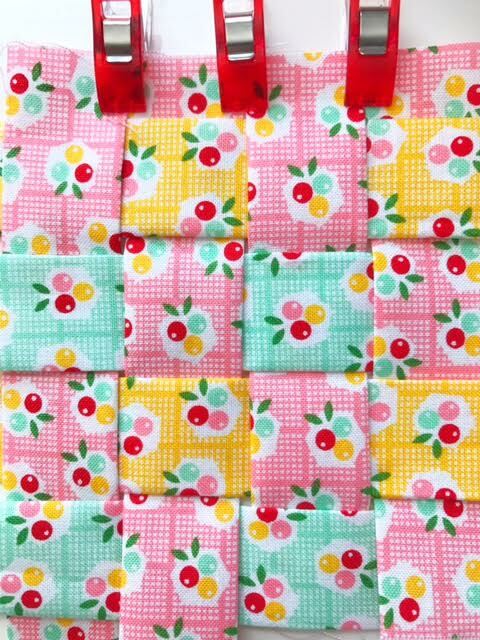 So when, I was asked to participate in Lori's Bee Happy Quilt Sew Along this month, I gleefully said yes. 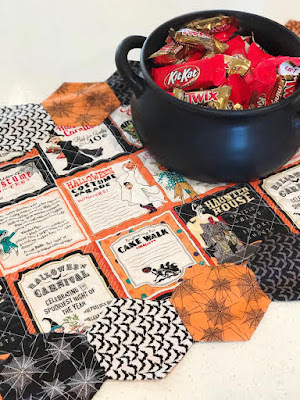 Lori Holt's projects are so much fun and I've always dreamed of making the entire quilt during a sew along. 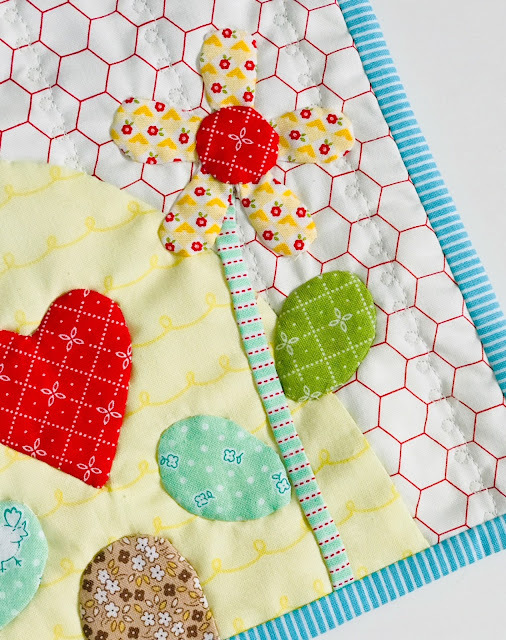 For this project, I chose 2 blocks - the flower box and bee hive and made these cute mini quilts. 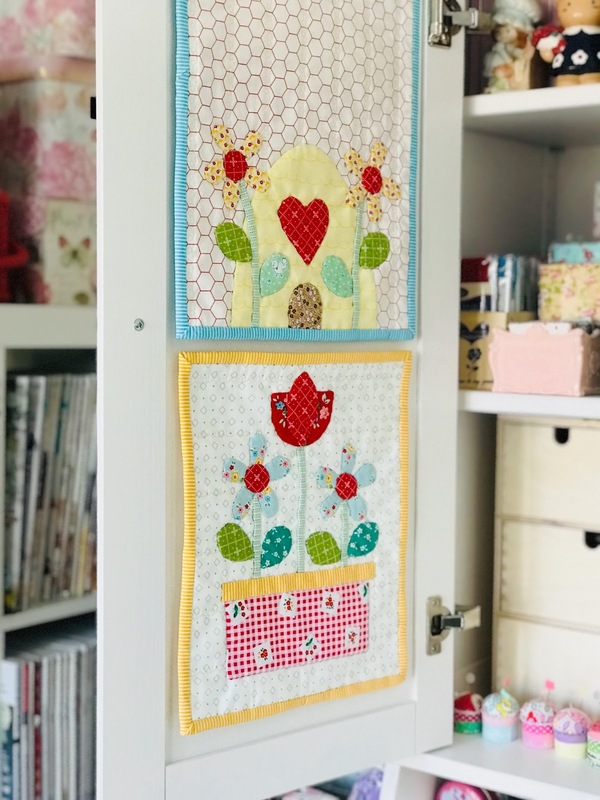 I have a blank wall in my sewing space, so I thought mini quilts would be perfect to start filling it. 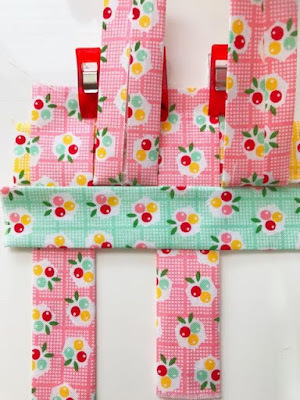 I've only started applique for dresden's and hexie blocks, so it was fun to use her Sew Simple Shape templates for the flower box and bee hive. It made the process easier that I may have to use more of her shapes for future projects! 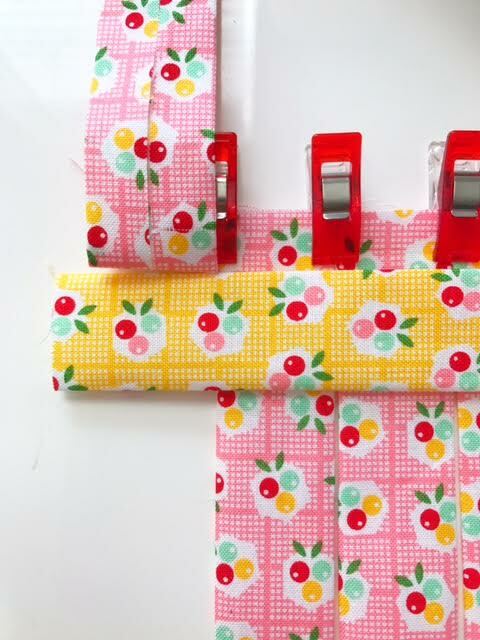 I'm not gonna lie, turning the flowers were the bane of my existence at first, but then I realized I missed Lori's advice to clip the corners. Clip the corners gals, it will make your life easier! After my mistake , it was smooth sailing from there and I was on a flower making, clipping corners frenzy! These actually were my favorite pieces to make. For the quilting, I decided to go with decorative stitches. These great little stitches are a cute way to highlight any shape to appliqueing. With the beehive, I quilted using a loopy stitch on my sewing machine. I thought these would be a cute touch with the beehive. 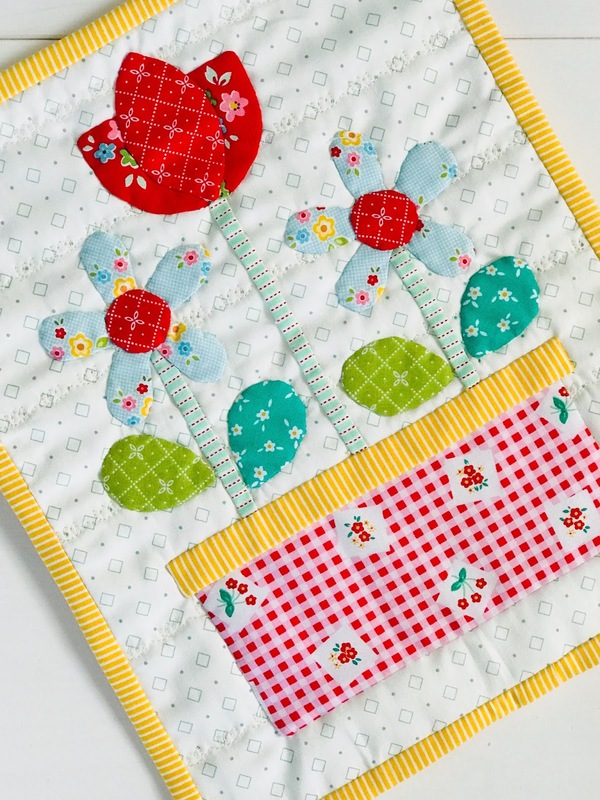 With the flower box, I used a tulip stitch for the quilting to highlight the flowers. 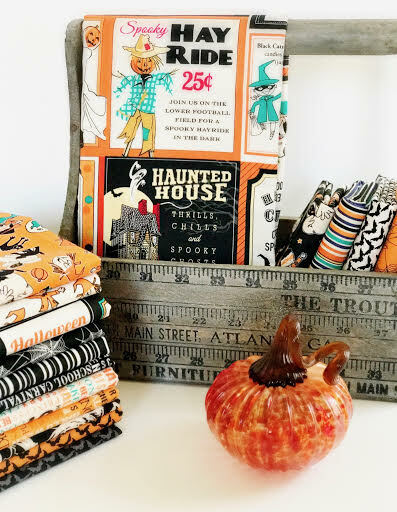 I chose all my favorite Riley Blake and Penny Rose fabrics I've been hoarding. inside of my sewing cabinet. Please excuse Rosalie's bedhead. 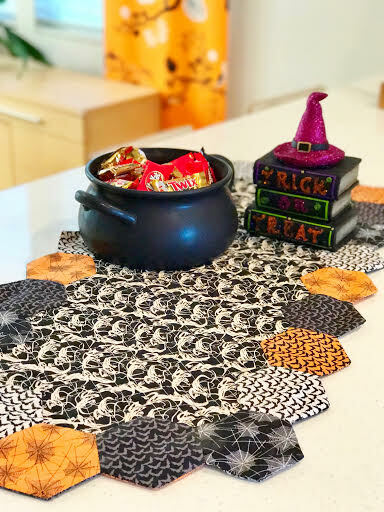 It was such a fun process making these projects and I can't wait to make more. 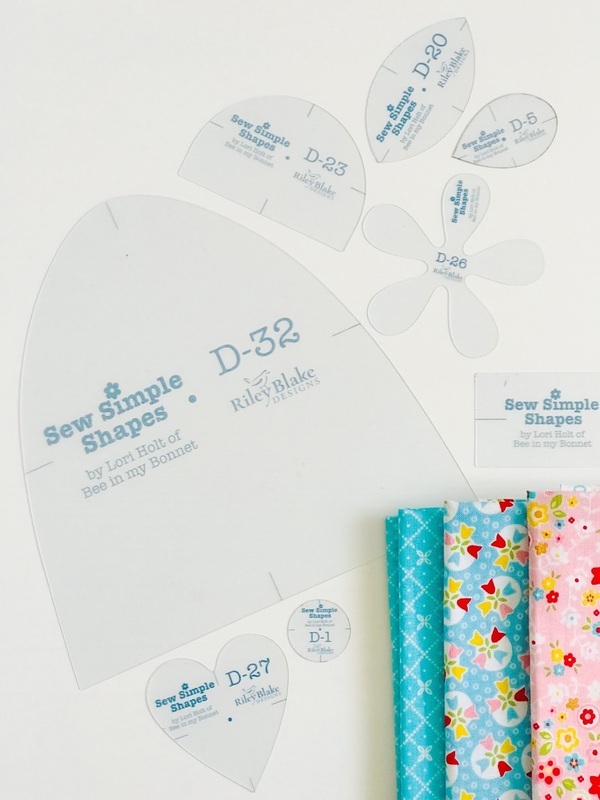 I'm starting on my Christmas gift making bonanza and I think Lori's Sew Simple Shapes are definitely going to be included in some of my gifts! 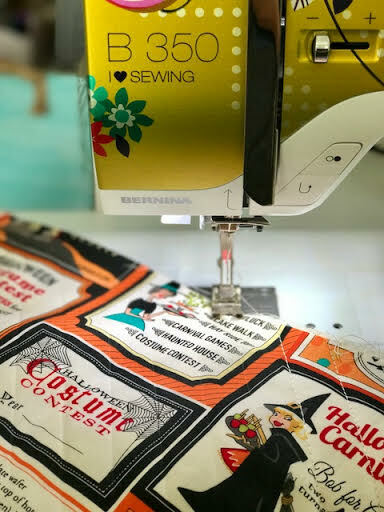 Happy sewing everyone! 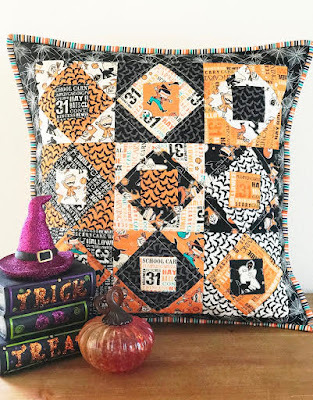 I can't believe Fall is a couple of months away but I am excited for cooler weather and Halloween! 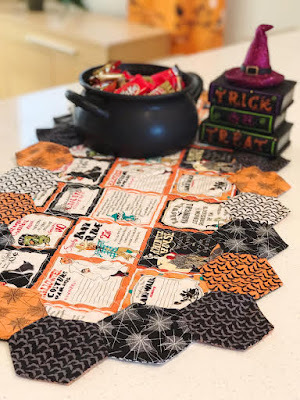 It's been ages since I've been around my blog but I'm back, here to share my project for the Trick or Treat blog tour. The fabric is from Carta Bella for Penny Rose Fabric and Riley Blake Design and it's so darn cute! I made a Halloween table runner (for me it's a counter top runner as my dinner table is out of commission but really with twins I pretty much eat anywhere I can within 5 minutes haha!). I hand sewn giant EEP's to create the border. I made 2 panels and sandwiched the quilted center fabric in between. I made it reversible, just in case you spill any melted chocolate on it. Yes, I already ate ten of those candy props. 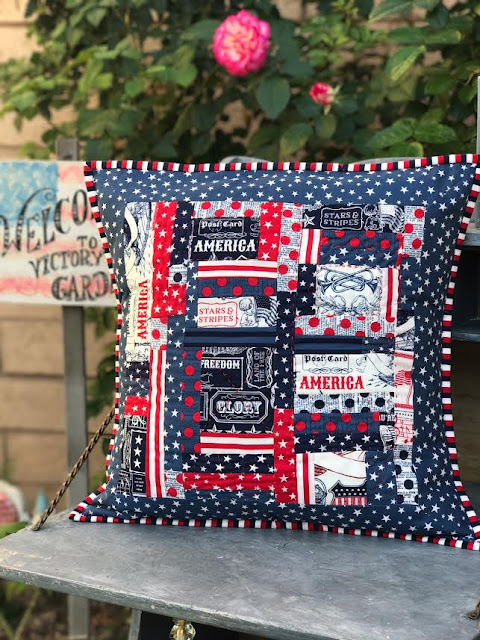 I burned the midnight oil last night and was able to make this cute pillow using economy blocks. I think my favorite thing ever when making things is sewing the binding, specifically with striped fabric. The striped fabric in the Trick or Treat line is so cute and really highlights all the colors in the fabric range. If you follow me on my Instagram account, I've been making a few things here and there, but have been holding off on big projects until now. 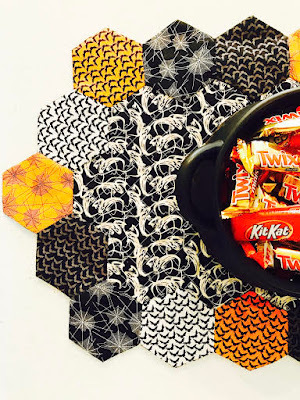 Perhaps this is a good time to start on Christmas projects too! See you soon! Hi Friends! 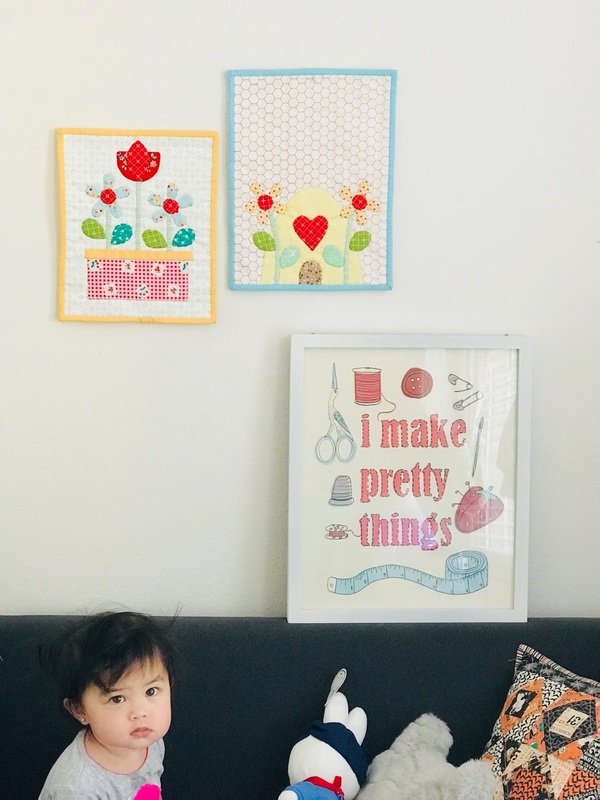 I finally feel like I'm out of hibernation from being a twin mommy! Lately I've been making some pretty neat projects inspired by upcoming seasons and this project reminds me of fireworks, BBQ's, and summer. 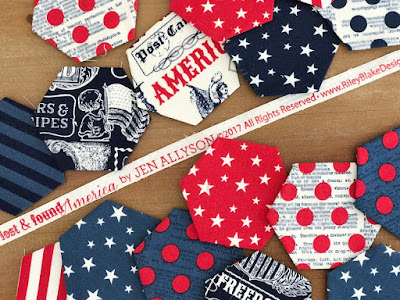 Lost and Found Americana designed by Jen Allyson for Riley Blake Fabrics is patriotic, vibrant, and simply stunning. 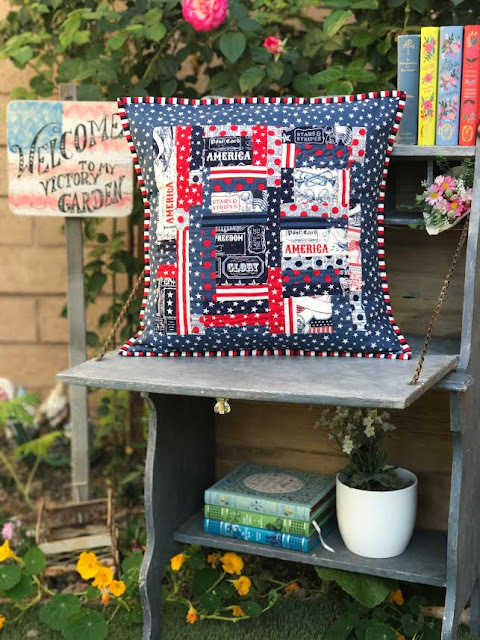 I made a patchwork porch pillow, using an array of patriotic patterns from the line. Lost and Found Americana Porch Pillow. 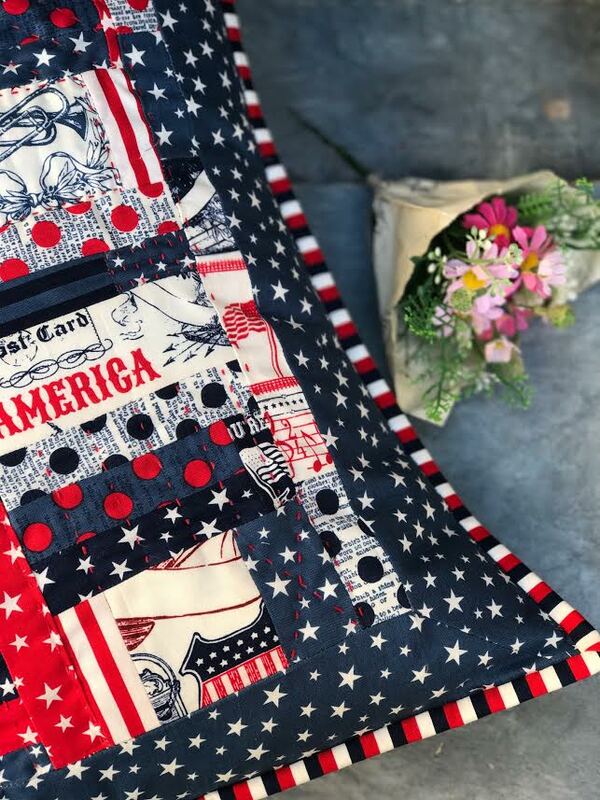 I come from a military family, so this fabric line is near to my heart and also July 4th is one of my favorite holidays because fireworks of course! I didn't use a specific pattern. Just measured the pillow insert and went from there. 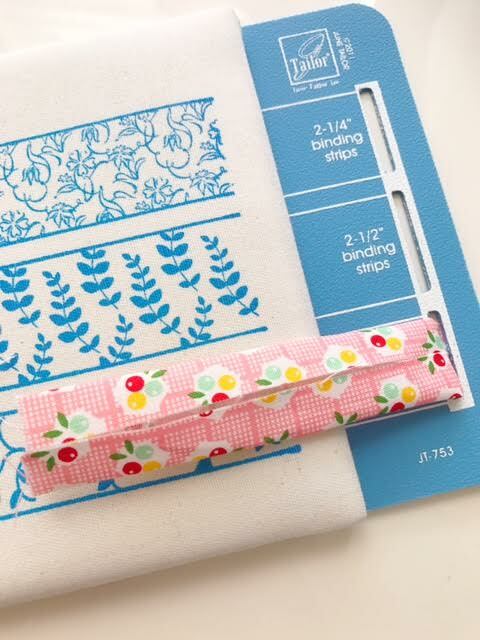 The fabric prints were so pretty, I thought the best way to showcase them was with a freehand type of design. Here's what I started off with and it just grew from there. My favorite print is the little girl holding the flag. I hand quilted in random spots that I felt would look pretty. I think it came out quite nice! 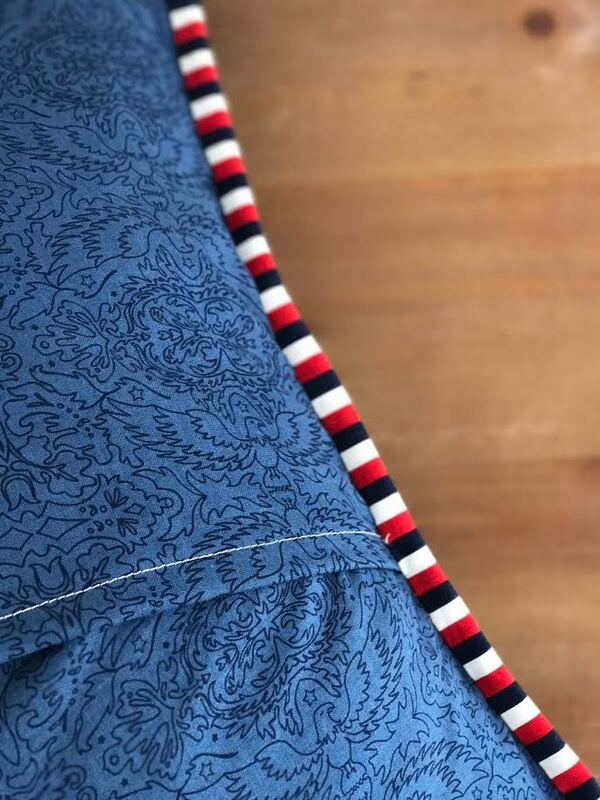 I used the stripes for the binding to bring it all together. 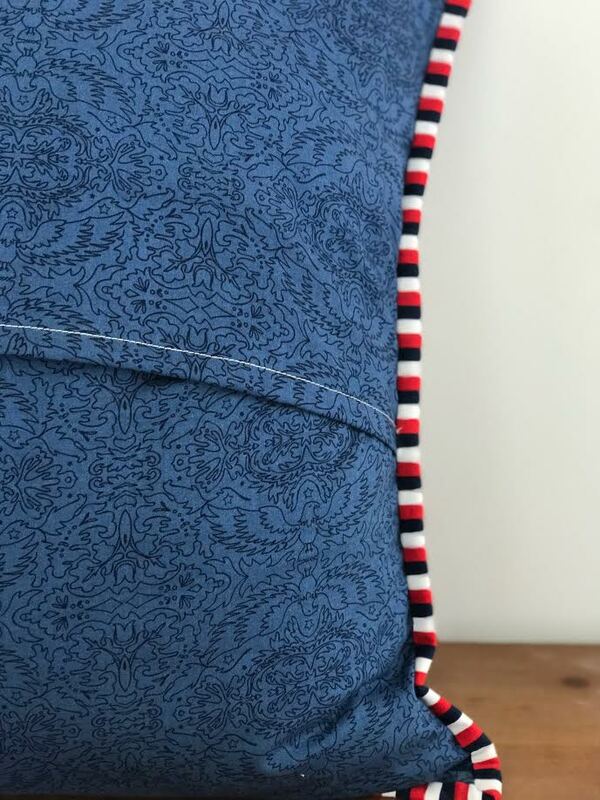 The back of the pillow has the American eagle blue print. I thought it was perfect for the back. Lost and Found Americana is available now! 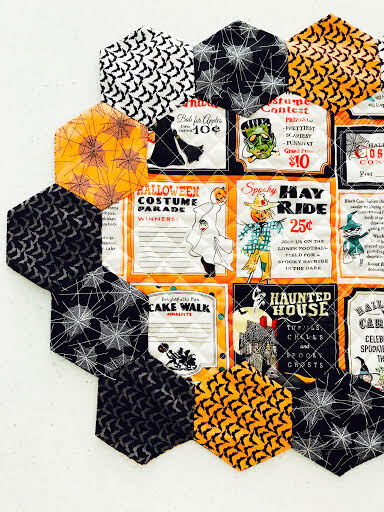 Check your favorite or local fabric retailers if they have it in stock. 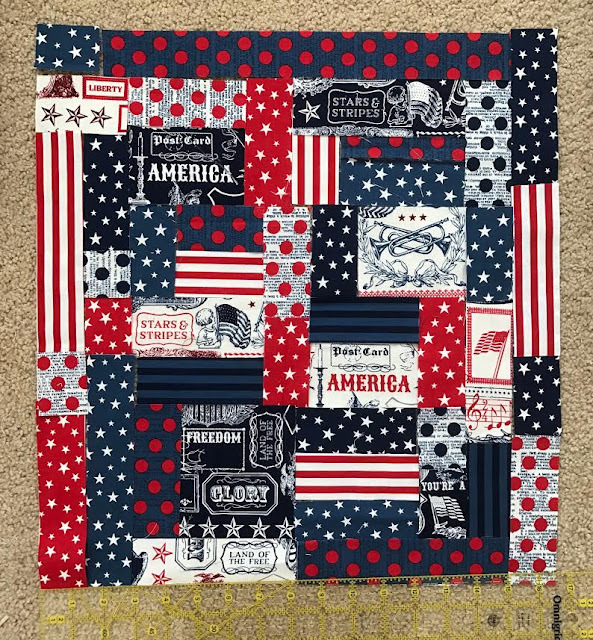 It would be a great time to get started on your July 4th and summer projects! Thanks for checking out my latest project. See you soon! Hello! 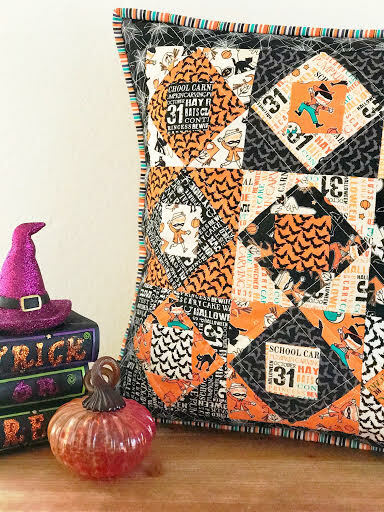 Welcome to the Lily Fabric Blog Tour! 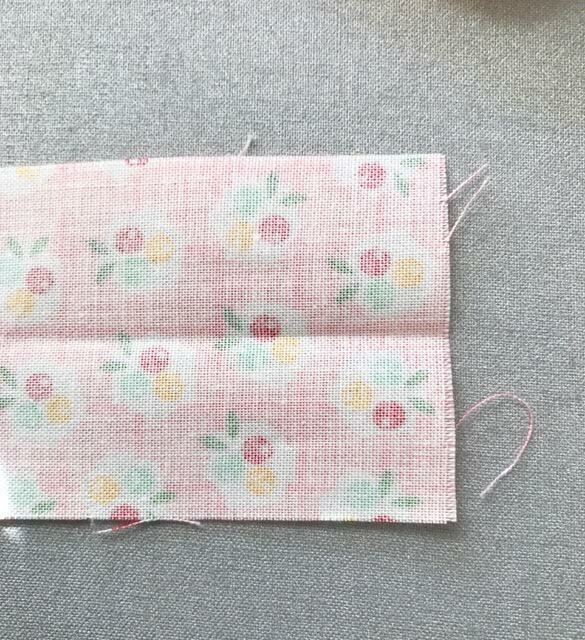 Lily Fabric is designed by Sue Penn for Penny Rose Fabrics. 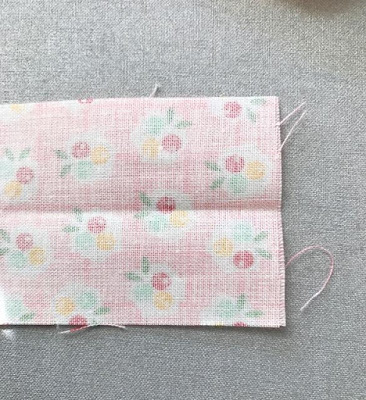 She has been designing fabric for almost twenty years and it truly shows in Lily Fabric. 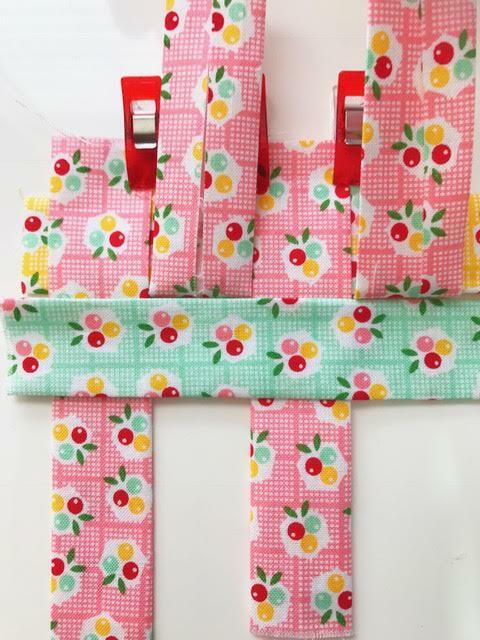 With mint, pinks, yellow, floral's, gingham's, and sweet polka dots, this line is simply beautiful and so in line for springtime. So, when I was asked to create something for the release, I was so excited and inspired to make something pretty! 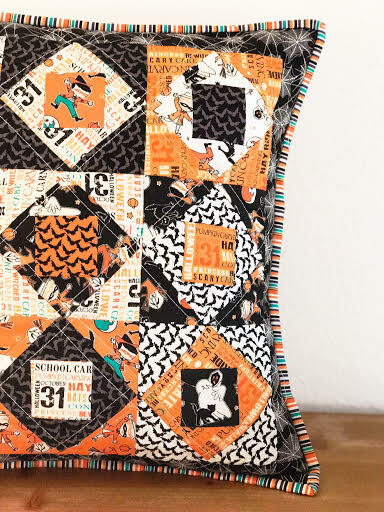 I made a quilted, springtime bag with hexie detailing. 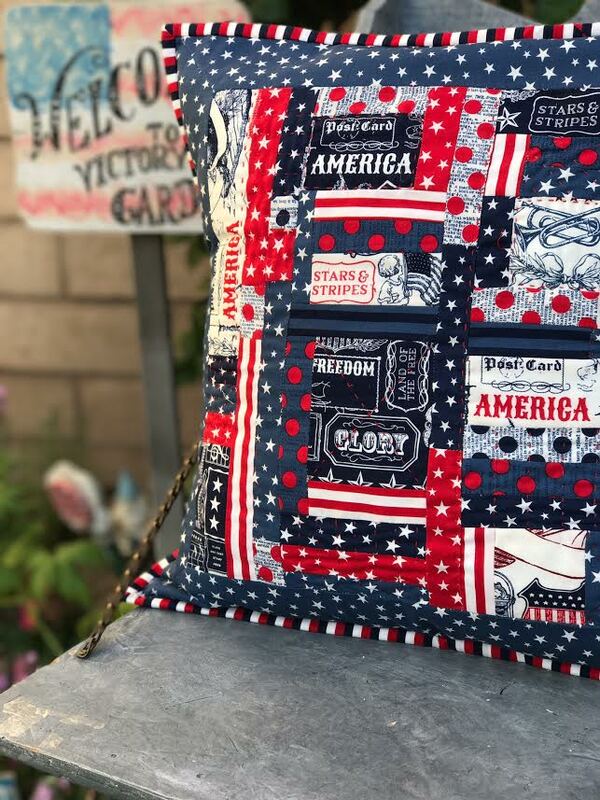 I quilted the side panels and used quilt batting to keep the bag soft and light. I created a large zippered pocket for the backside so it can hold your phone, keys, and such. Back of bag - quilted with a back zippered pocket. I added inner pockets so it can hold more things like a wallet or a phone, or if you like are me, baby toys, bottles, pacifiers. Oh I didn't tell you, I have twins! 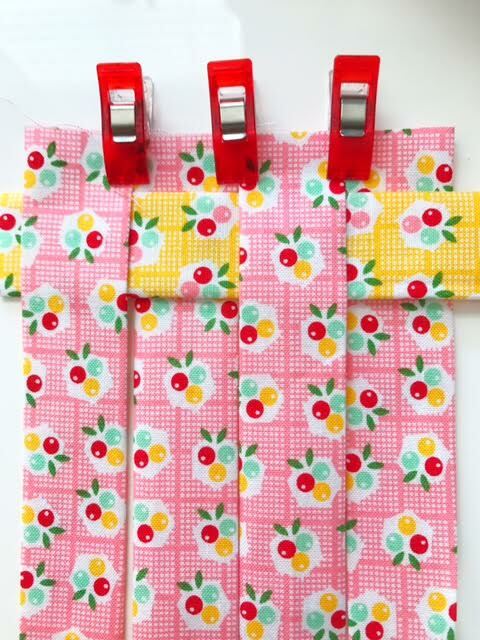 I usually add all kinds of pockets to any bag I make because of the stuff I have to lug around ha! 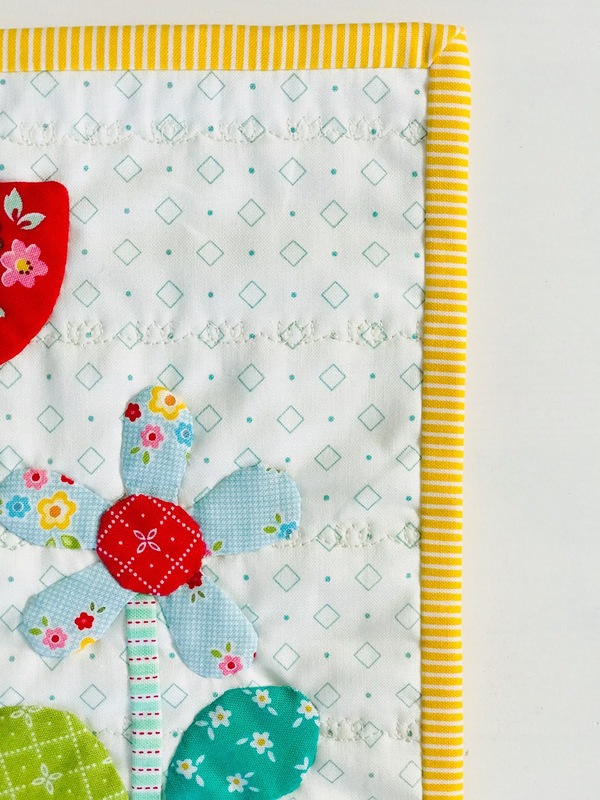 Aren't the polka dots and tiny floral's just so sweet? 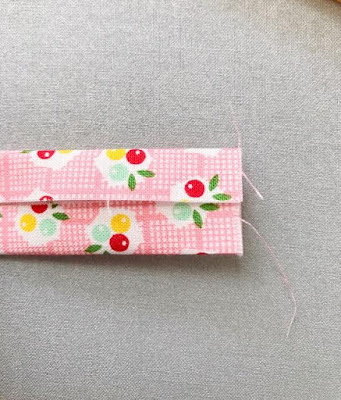 I also had time (while my babies were napping) to make a cute pouch using a weaving technique I've been experimenting with. 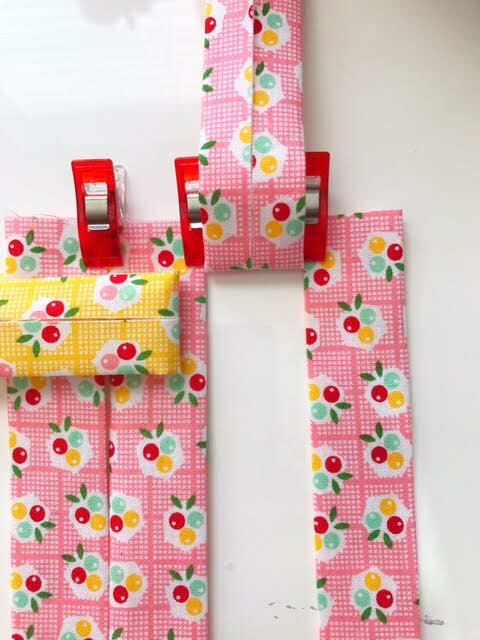 I thought it would be a great way to showcase the floral's in the Lily Fabric line. Handmade pouch with weaving technique. 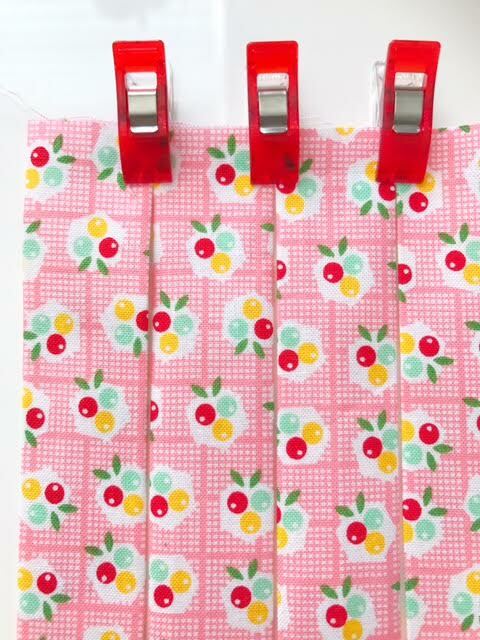 Thanks for stopping by and checking out my handmades for Lily Fabric! 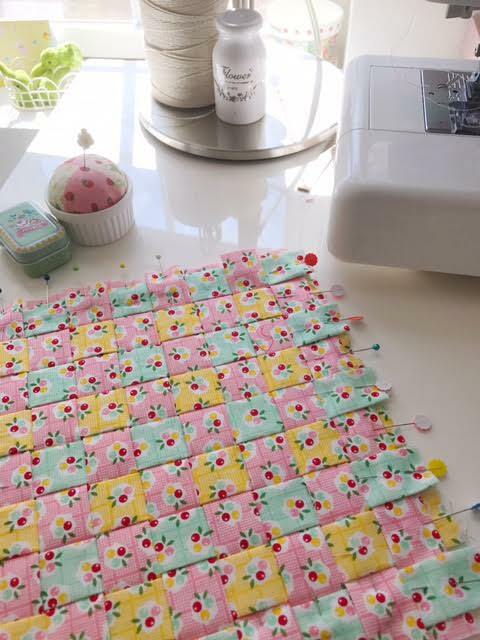 If you want to make something pretty just in time for Spring or even Summer, Lily Fabric will definitely be a wonderful choice! I'll be back real soon with another project. Hello! Thanks for stopping by! It's been a while since I've been here, but I wanted to share how I created the fabric weave pillow since some of you asked (Instagram can only show so much!). 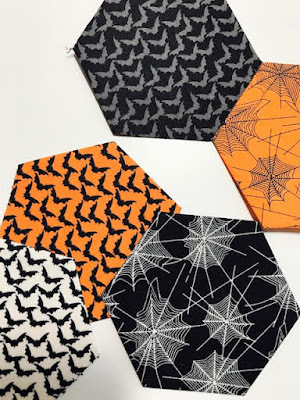 I have some upcoming projects and I wanted to test out some designs I've been thinking about for a long time (while I raise my twin babies I daydream of sewing!). 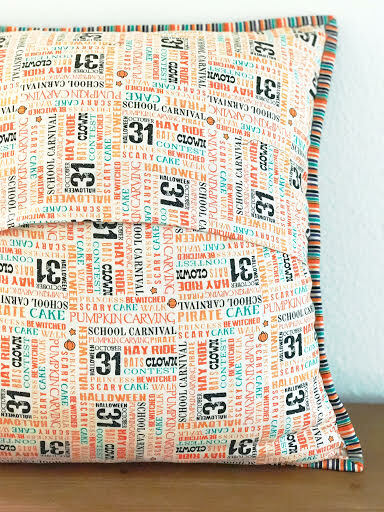 I made this small pillow for my baby Rosalie who loves colors and textures. She already has played in my fabric cabinet! The back of the pillow. I used an envelope flap for the pillow insert. First, cut 2 inch strips of desired length of cute, contrasting fabrics. I used "Backyard Roses" by Nadra Ridgeway for Penny Rose Fabrics. 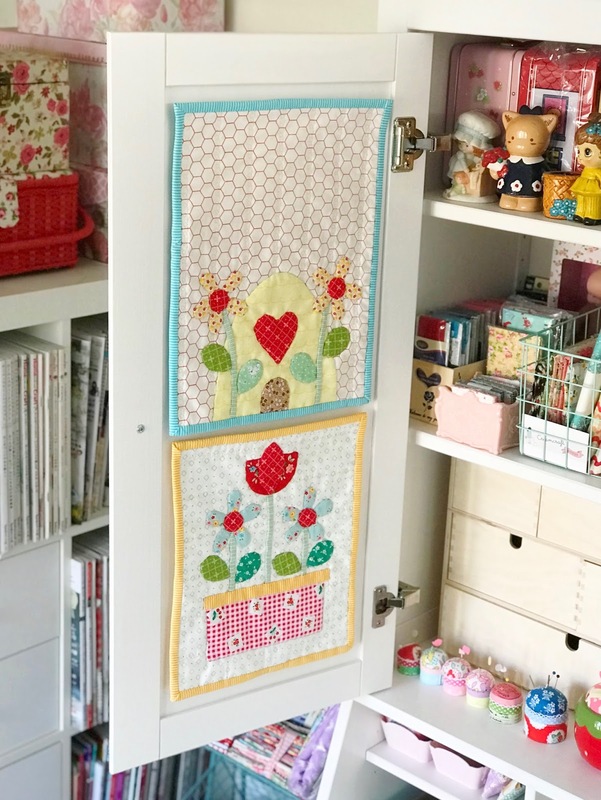 If you know me, I am a bonafide fabric hoarder and this stash has been in my special hoarding cabinet, displayed nice and pretty for a long time now. Next, fold a strip in half. I love this tool! 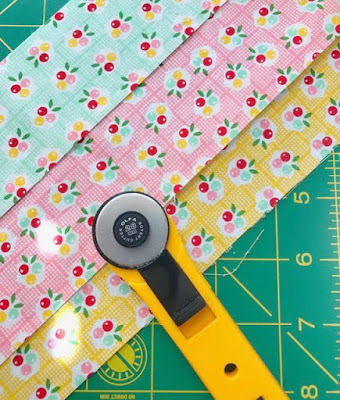 It's my go-to tool when I make bias tape for my quilts. It's called the Quilt Binding Express. Got mine at Joann's. You run the strip through the opening and press with an iron. When you have your desired amount of strips, lay them out evenly and use clips or pins to hold them together. Now, with the contrasting fabric, start weaving into the first layer you pinned together. 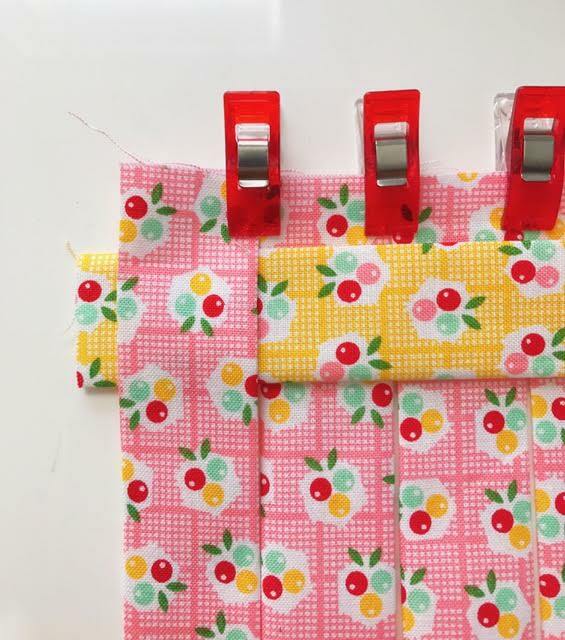 Lift one flap up and place the contrasting fabric onto the layer you created. Skip the second piece, and go onto the third. Repeat this process until you have the desired length. 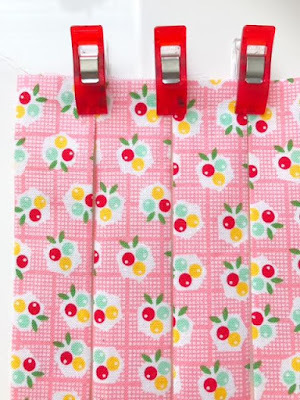 I love this technique because it's a good way to use fabrics you love, without having to cut and sew teeny tiny squares! I ended up with a small 9x9 weaved piece. I trimmed up all the edges, pinned and sewed around the entire piece to hold all the weaving together. 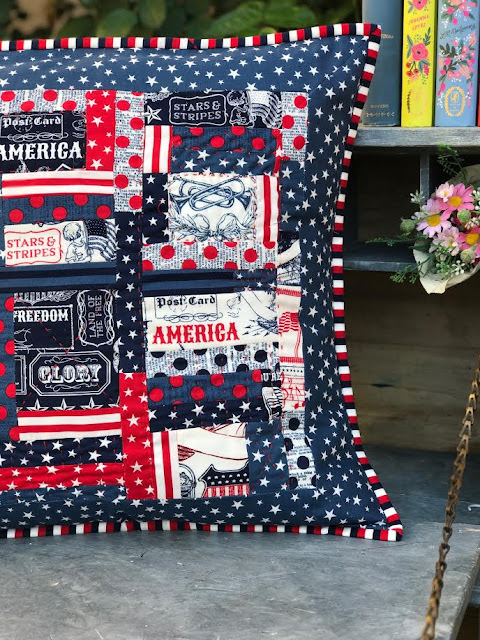 Then I proceeded making the pillow, and I apologize, but I didn't take any pictures of the pillow making process (mommy brain! ), but I'm sure most of you know how to make a pillow? Thanks for reading my tutorial! I'll be back soon with a new and cute project!